"This is a very delightful meal. Very simple, and my two-year old loves it! Interesting taste and texture. Serve with white rice." Heat the olive oil in a skillet over medium heat, and cook the garlic just until golden. Mix in mushroom pieces, and cook 10 minutes, until tender. Pour the broth into the skillet. Stir in butter until melted. Season with Italian seasoning and salt. Watch how to make this versatile recipe. A pretty good recipe. It's a nice, light sidedish with a mild flavor. Goes well with fish. This was delicious! It was my first time trying shiitake mushrooms, and now I'm certainly hooked. Just great and easy. It took about 20 minutes or so and my parents loved how it tasted, specially when topping some fresh toast. Wonderful! 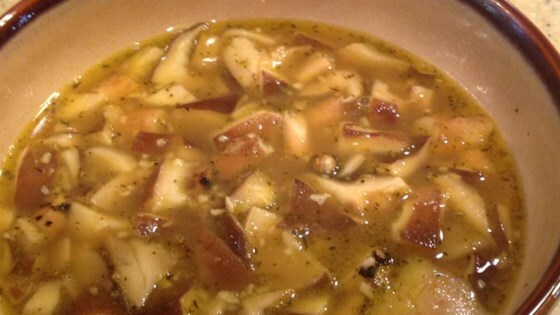 (and I don't care all that much for mushrooms) Used less liquid, and just 2 lg garlic cloves. We savored every bite. This was really good. Something different.